The Certify-Able Data Professional: How Far Can You Go? Do you have goals? I bet they don't stack up to Conference Keynote Speaker and long distance swimmer, Lynne Cox's! Or perhaps you never thought of swimming the English Channel, or the icy waters of Antarctica. After Lynne's inspirational account of her long distance swimming adventures, I had a new appreciation for what it means to set your mind to something and achieve it. When she was fifteen years old, Lynne swam the English channel and set a record, then she beat the record again a few years later. In 1987, she had to wade through a myriad of politics to make a goodwill swim to the Soviet Union, and if that wasn't enough for one lifetime, she was the first person to swim over a mile in the icy waters of Antarctica (without a wetsuit!). Burrrrr! That definitely pushes the limits of what our human physiology is designed to handle. A Discovery Channel video was shown of her swimming to Antarctica. Her message is that sometimes weird ideas can work out really well and if you put your mind to something, you can make big things happen. With big ideas and a great team you can achieve anything. When someone from the audience asked if she had other passions besides swimming, writing and speaking she quickly quipped "yes, Data Management," bringing a roar of laughter and applause from the audience. 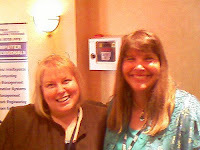 I had an unexpected opportunity to meet Lynne later in the day (and wow, I even got someone to take a picture!). I was curious about how long it takes for her body to recover from the cold after a swim in icy waters. She said it can take 3 or 4 days, and her swimming accomplishments have contributed to scientific knowledge about how the human body recovers from cold. Her warm and genuine speaking style and amazing stories were inspirational. They illustrate how much humans can accomplish with smart and focused determination. I'm ready to go get her book!